With reports of another injury to Domonic Brown, the usual high hopes for the prized Phillies outfield prospect have taken another dip in the waters of woe. In recent years, the toolsy Brown has had many ups and downs as he has tried to rise to the highest level of baseball and stay there. Here's a look at some key moments in his so-far frustrating career. June 6, 2006 - Brown is selected in the 20th round of the MLB amateur draft by the Phillies out of Redan High School in GA. Brown signs his first pro contract one week later. August 6th, 2006 - Brown hits his first professional HR for the Gulf Coast League Phillies. 2007 - Led the short-season Williamsport Crosscutters in hits (84), average (.295), SB (14) and games played (74). 2008 - Led the Class-A full season Lakewood BlueClaws in hits (129), runs (77) and SB (22). 2009 - Named a mid-season All-Star for the Class A Advance Clearwater Threshers. In 66 games there, Brown batted .303 with 11 HR and 44 RBI before earning a promotion to Double-A Reading. Brown's line for the remainder of the year- .279/.346/456 in 37 games. 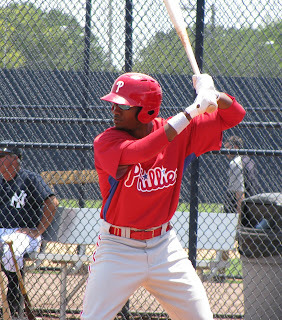 2010 - Prior to the season, Brown is named the Phillies' top prospect by Baseball America. July 28, 2010 - Brown called up to major leagues for first time, hit RBI double in first big league at bat. August 10th, 2010 - Hit first major league home run against Dodgers' Ronald Belisario and notched a career-high 4 RBI game. March 5, 2011 - Brown diagnosed with broken hamate bone in his right hand. Misses approximately seven weeks. April 26, 2011 - Brown returns to baseball activity and rehabs with Clearwater. July 29, 2011 - Brown sent back to Triple-A after Phillies acquire Hunter Pence. September 16, 2011 - Brown promoted to major league team when Triple-A Lehigh Valley's post-season ends. Has just one at bat in the closing weeks of the season. 2011/2012 off-season - Phillies general manager Ruben Amaro expresses his "druthers" in relation to Brown, saying it would be ideal for the 24-year-old to spend a full season at Triple-A Lehigh Valley. 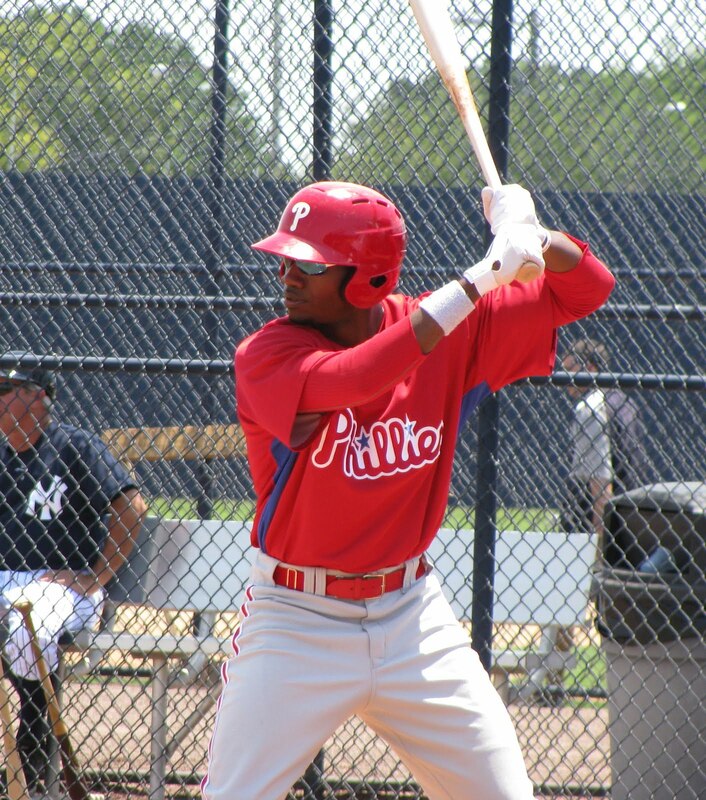 March, 2012 - Brown posts a .300 batting average with two triples and a homer in seven spring training contests with the Phillies. April 5, 2012 - Brown opens season with Lehigh Valley, going 0-for-4. May 7th, 2012 - Brown sidelined with a left hamstring strain. Misses more than two weeks of action. May 24, 2012 - Brown gets his first look in centerfield. June 14, 2012 - Brown leaves IronPigs game with apparent knee injury.